Congratulations everyone! It’s official: Frack Free Denton turned in nearly 2,000 signatures of registered voters who want to ban fracking within the city limits of our town. Thank you so much to everyone who signed, circulated petitions, knocked doors, tabled, hosted events, donated, played music, spread the word, and supported the first leg of this journey! This is truly a citizens’ initiative in every sense and the support it has garnered is a true testament to how ready we are as a city to be frack free. As Cathy McMullen, president of DAG said today as she turned in the petitions to city hall, “We have something industry can’t buy: a community that wants to protect each other”. We thank you so much for your part in this first phase. This should have been a no brainer but once again Denton city council chooses industry’s wants over residents need for a safe place to raise their children. An editorial by Cathy McMullen that appeared in Earth Island Journal. As a life long Texan, I grew up with oil and gas drilling. As kids, pumpjacks reminded us of Texas-sized grasshoppers. And we greeted each new well with anticipation because it might mean big money for family or friends. But that was before the pairing of horizontal drilling with high-pressure, slick-water fracking morphed oil and gas development into a different animal entirely. Today, oil and gas wells bring fear to neighborhoods. 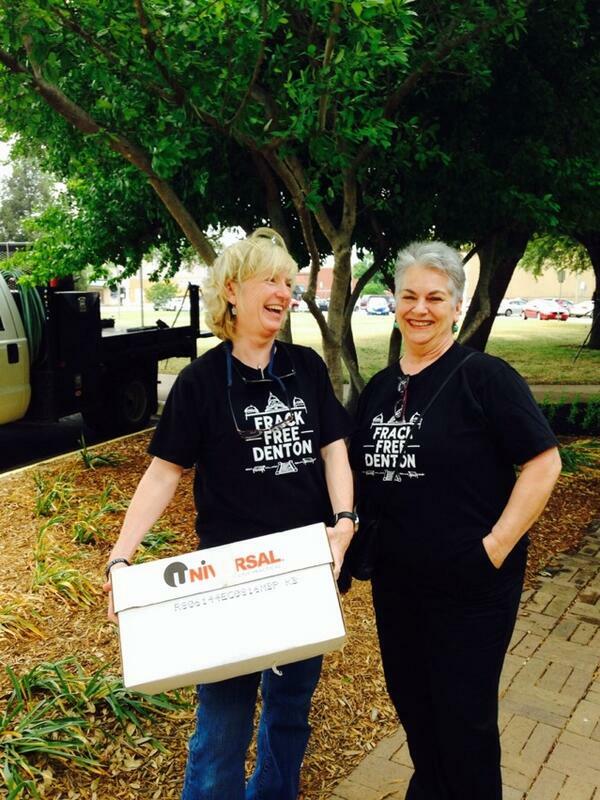 May 1st, Denton — Today the Denton Drilling Awareness Group (Denton DAG) released infrared videos of fracking sites within the city, and summa canister test results showing toxic benzene in a city resident’s yard adjacent to a fracking operation. Both prove the City Council is breaking its public promises to monitor fracking air pollution. The series of videos from the three fracking-enabled drilling sites, — taken over a period of several weeks with an infrared FLIR camera widely used by Texas regulators, — show Volatile Organic Compounds pollution near residences. VOCs often include cancer causing toxics like benzene. In 2013, the Denton City Council promised in an open public meeting that it would, if not proactively prevent pollution from fracking operations, at least monitor those operations to insure that they weren’t polluting the air. This promise was essential because a loophole in the Denton City ordinance allows some fracking operations within 250 feet of residences. The Denton Drilling Awareness Group is in the final stages of gathering signatures in support of a ballot initiative to ban all fracking within city limits. The initiative would not ban oil and gas extraction, just hydraulic fracturing. The Denton city council voted 7 to 0 to repeal the noise ordinance for gas well drilling sites on 3/18/2014. You can read DAG grades for the new drilling ordinance in 2013 and see an A was given to the new drilling ordinance noise requirements. Well, it seems the frackers were having a hard time complying so the city has decided to increase the noise allowed at drilling site from 65 dba to 85 dba. The explanation we received was it would be easier to “enforce” the increased noise limits and make it easier for the police dept. to “enforce legitimate complaints”. Having been at the Vintage and Meadows of Hickory Creek neighborhoods during fracking, flowback, and flaring I can guarantee you all noise complaints were legitimate and the city did not enforce the noise ordinance at 65dba. So it does make perfect sense to keep raising the limit until the city can find a noise the frackers can comply with, say 150dba?